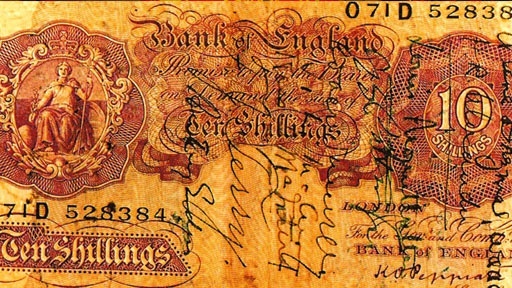 A man in New York City has a British ten-shilling note dated July 25, 1942 that is an autograph hunter’s dream: a single slip of paper, called a “Short Snorter”, signed by almost every luminary on the Allied side of World War II: from Patton, to Churchill to Roosevelt. The date on the bill is the same as a major Allied meeting held in London, where a momentous decision was made that would set the stage for the rest of World War II. Nazi troops were advancing across Europe. The time had come for America to join the battle, and for the Allies to open a second front - but where? History Detectives finds out whether this short-snorter was witness to the fateful agreement that forged the alliance between America and Britain. Related Investigation Survivor Camera Did this antique camera save a Polish Jew during the Holocaust? Related Investigation Creole Poems Does this manuscript contain words of love or illegal acts of rebellion? Also in Depression and WWII: 1929-1945 Scottsboro Boys Stamp Did a penny stamp help save the Scottsboro Boys from the electric chair? Also in Depression and WWII: 1929-1945 Hindenburg Artifact Was this device snatched from the burning wreckage of the ill-fated zeppelin? Also in Season 5 Muhlenberg Robe Was this robe torn off during a fiery sermon to rally congregants to the cause of the Revolutionary War?